Brighten up your mornings with the light and welcoming feel you get from white kitchen cabinets. White kitchen cabinets are available in a variety of styles, from sleek and modern to more rugged or antique looking. White kitchen cabinets have long been a popular choice and that trend doesn’t appear to be letting up any time soon. They lend a crisp and clean appearance to a room and can help make smaller kitchens feel larger. If you’re considering white kitchen cabinets, but worry about the loss of color, consider adding opportunities for contrast by using splashes of color throughout the rest of the room. You might use darker countertops and floors, for example, or use dark brown, black or metal knobs and drawer pulls for visual interest. To add small splashes of color, consider appliances, like toasters and mixers, in a bright and inviting hue. Another option is using glass front doors and letting your colorful dishes show through. Put those dishes to work, even when you aren’t eating from them. It’s an easy way to bring in color and it can be switched out seasonally or whenever you feel a whim for a new look. White kitchen cabinets make a great platform to transform your kitchen again and again. 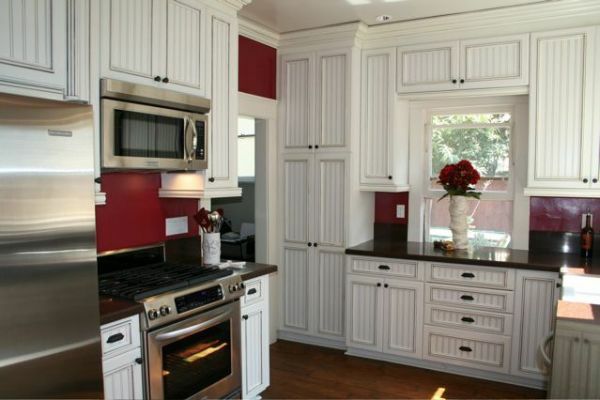 Get more info on how Cabinet Wholesalers can help you with white kitchen cabinets by calling us at 714-693-1111.